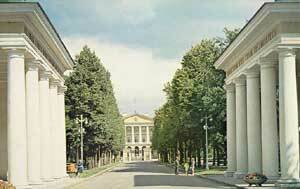 The Smolny Institute - headquarters of the revolution of 1917. Built in 1806-08, architect G. Quarenghi. Foreground. 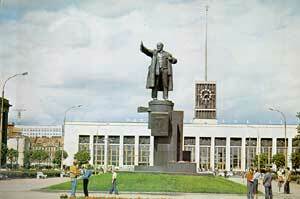 Monument to Lenine on Lenin Square. 1926. Sculptor S. Yevseyev, architects V. Shchuko, V. Guelfreikh. Finland Railway. Terminus. 1955-1960. Architects P. Ashastin, N. Baranov, Y Loukin, engineer I. Rybin.